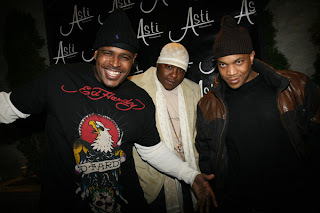 Styles P, Album release had a slight reunion aura when Jadakiss and Sleek Louch arrived. Jadakiss rocked a cashmere Louis Vuitton scarf and matching beanie set with a soft blazer and Sheek Louch was wearing a t-shirt in the very popular brand, Ed Hardy. The "surprise" birthday party and album release honoree Styles P wasn't looking too shabby himself in the goose down filled RLX coat. Them boys got SWAG. 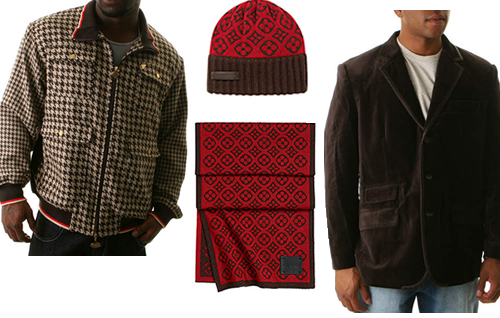 The brown and white houndstooth jacket is Parish and the cotton blazer is Marc Ecko. These options represent two different looks that you can pair with the LV set, courtesy of Dr. Jays Urban Apparel online. 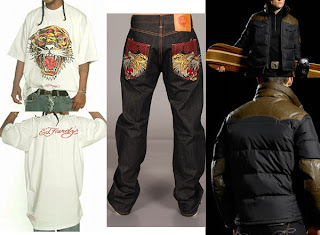 The white t-shirt is an Ed Hardy tee, and the jeans are Ed Hardy denim, the coat is a pic of the RLX coat that Styles P was wearing. Oh, looks all the outfit was totally cute and very fashionable. i love the style of "Super Gangster".keep it up! Hey! it's me again. just want to ask where do i find those cute shirts? they seems very attractive. hope to see more cool shirts on your post! What cool shirts Sidney....the Ed Hardy???? I'm sorry forgot to mention the cool shirts i said... Yeah your right! the Ed hardy shirts. hope to see more cool shirts..
Did you shop online yesterday? Trina is shiek? ROCK OUT!